Yesterday, my precious granddaughter, Stella (our only grandchild), turned eight years old. Of course, to commemorate this auspicious occasion, I wanted to create a card that would be as special to her as she is to me. I had recently gotten -- ahead of time -- a darling set from this year's Sale-A-Bration catalog, Honeycomb Happiness (found on page 15 of the Sale-A-Bration catalog). 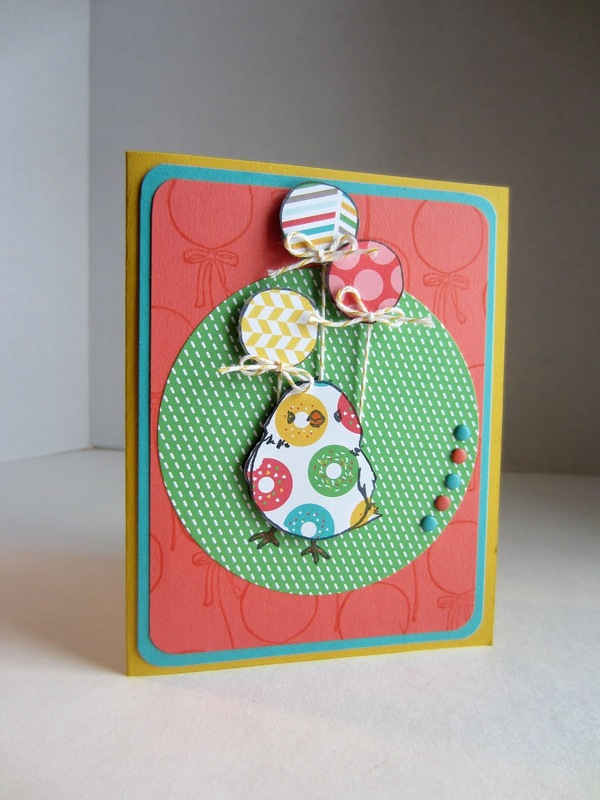 Even though this set was designed to coordinate with the Honeycomb Embellishments (which will be able to be seen on page 9 of the upcoming Occasions Catalog), I immediately saw the three images -- an ice cream cone, a balloon and my little chick, pictured in my card in this post -- as wide open line images, which . . .
You guessed it: I could stamp them on scraps of Designer Series Papers and CUT THEM OUT! And do paper piecing! Yayyy! NOTE: We are traveling two hours each way to visit my parents on New Years Day, so I stamped many many of these images in readiness for four hours in the car. And lots of FUSSY CUTTING! I'm so efficient, eh? Anyway, back to the special card for Stella. 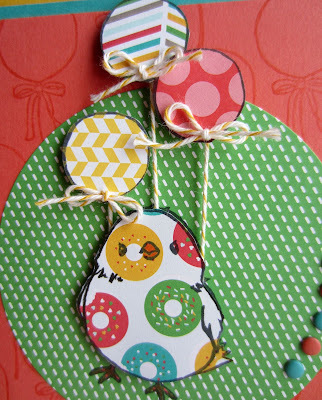 I stamped the chick on a piece of the paper found in the Cherry on Top Designer Series Paper Stack (page 144 of the big catalog), obviously the one with the chewed-on donuts. 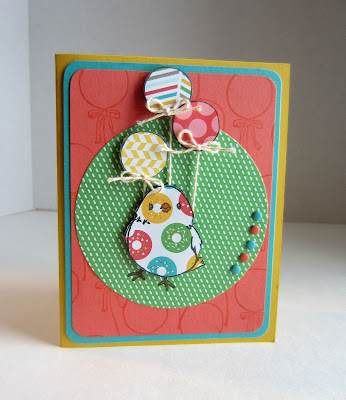 I then found some scraps of DSP that featured coordinating colors to create three balloons. The background circle on which my Balloon Chick rests is also a sheet from the Cherry on Top stack. 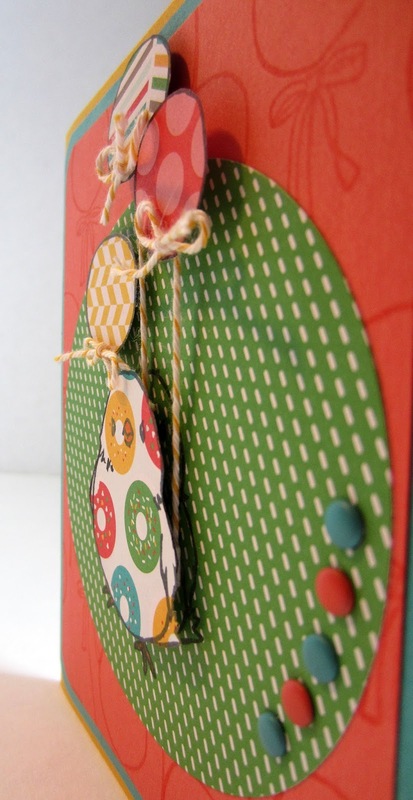 The circle was, of course, cut with the Circles Collection Framelits. 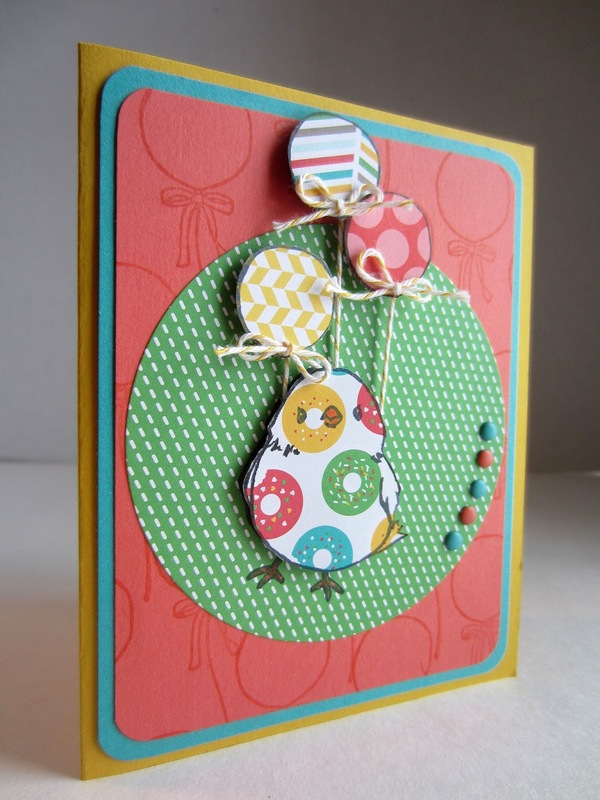 I topped the chick and the circle onto Calypso Coral cardstock on which I stamped the full balloon image randomly in Calypso Coral ink. Then a layer of Bermuda Bay on top of Crushed Curry formed the rest of the card base, giving me a very colorful, very wonderful card. 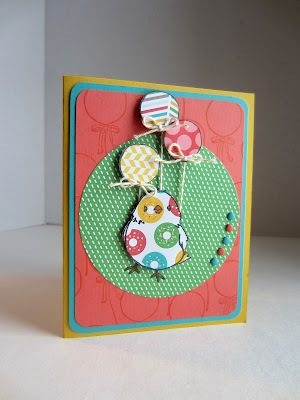 I love the dimensional look of popping up with Stampin' Dimensionals the chick and her three balloons! The Candy Dots arranged in an arc added a bit of interest also. During Sale-A-Bration, which runs this year from January 5 through March 31, you can choose one of the freebies from the special SAB catalog for every $50 you purchase (before tax and shipping). Contact me if you would like me to mail you one of these catalogs! Also, the new Occasions Catalog will go live on January 5. 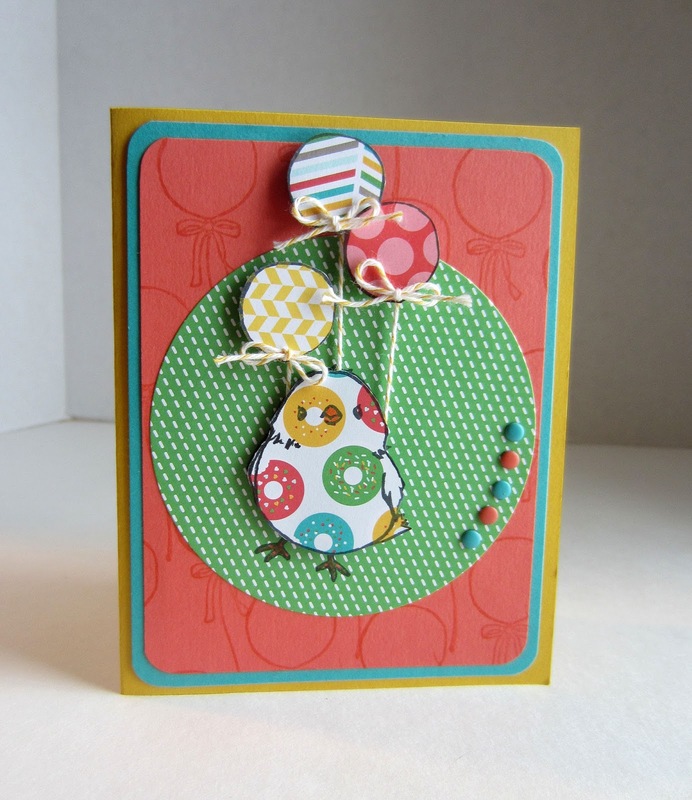 I will be showing you in upcoming blog posts projects I have made using some of the new products. Stay tuned. HAPPY, HAPPY BIRTHDAY TO YOU, STELLA! This is really a cute card. Love the dimension!! That is such a cute card. A big Happy Birthday to Stella! Such a cute birthday card! I love the chick and the balloons! Thanks for sharing at Submarine Sunday! Love this idea! LOVE the colors even more!